If you belong to a suitable club or association, go the full nine yards with a blazer badge too. It is impossible to swill gin-and-tonics at your club or pub in anything else. There's no need for panic if you don't have a blazer. The tailors and gentlemen's outfitters, Benson & Clegg — situated in the Piccadilly Arcade, London — can help avert any accusations of treachery. Benson & Clegg was founded in 1937 and moved to its current location in 1976. 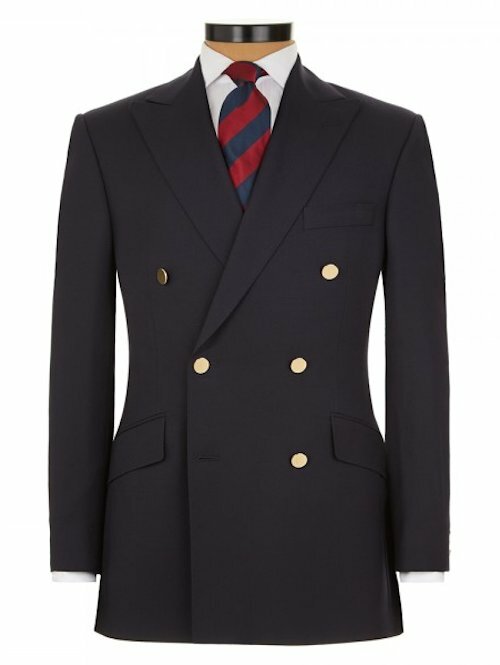 Dedicated to classic British style, the company earned Royal Warrants as tailors to King George VI and as suppliers of 'buttons, badges and military neckwear' to HRH The Prince of Wales. Pleasingly, Benson & Clegg have introduced a ready-to-wear range that includes single and double-breasted blazers in merino wool with polished gilt blazer buttons. The jackets have a four-piece natural canvas. Smart. Stolidly smart. Excitingly, for me at least, Benson & Clegg offer a wide range of blazer buttons in classic designs — all made in England — in gilt mainly, but with enamel and leather options. They stock over one hundred and fifty different designs. I think we'd better go with the Britannia buttons (top), hadn't we? Don't worry American chums, they also have an American Eagle design. All gilt buttons are created in time-honoured fashion and come with a presentation box. I know someone who collects old blazer buttons, like you would coins or stamps. I found her a lovely old button with an anchor design at the Royal Navy Fleet Air Arm Museum — wonderful museum if you have any budding engineers in your family. You can get up close and personal with old fighter planes and Concorde 002. The nickel-mounted Wolf Head design has something about it. So lovely, so traditional — I feel tempted to get hold of several designs and put the blighters on all of my jackets, but that would be silly. Silly good or silly bad? Hmm. Thanks for the tip - picked up a pair of Wolf Head cuff links in their sale today for £27.